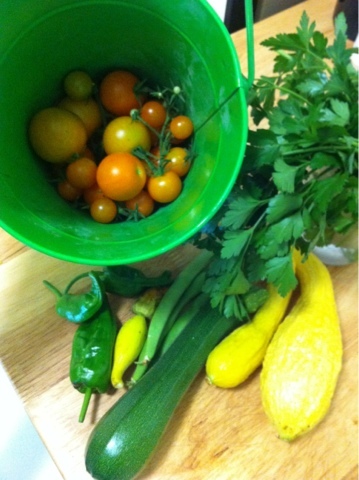 Just a few photos from today's harvest...what a bounty! The first picture (had to publish to see what order it'd post in - using the blogger app for the first time!) 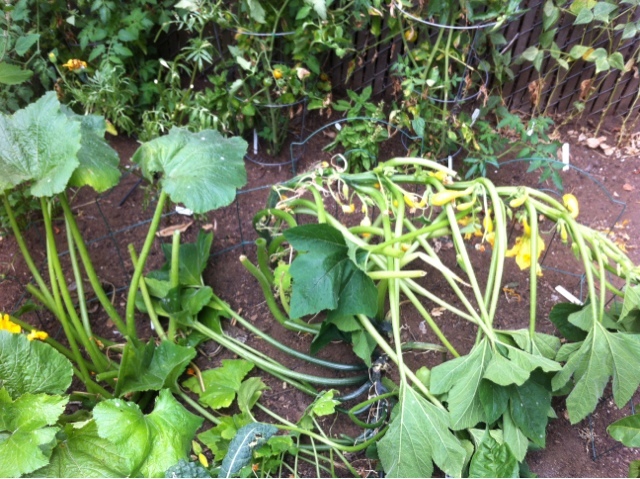 is of the crookneck squash plant I "flipped" upside down. It was growing pretty much on top of the zucchini so I tried (with marginal success) to re-route it. Since it has already been growing in the opposite direction, though, it looks a bit upside down. Thoughts? Am I going to kill it, making it grow this way? I also snipped a bunch of the leaves; they were so overgrown that the bottom ones and overlapping ones were getting mildewy/moldy (sprinkler heads underneath + not enough sunlight for moisture to escape I think). Thoughts on that, too? The second pic is some super cool tomatoes. Love how they're growing all rainbow-y. Adorable. Next up...the bounty (minus the 20 or so tomatoes we'd already eaten by the time I took this). 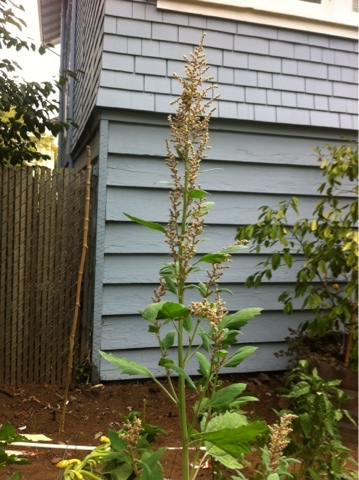 And lastly...what is this mystery plant? 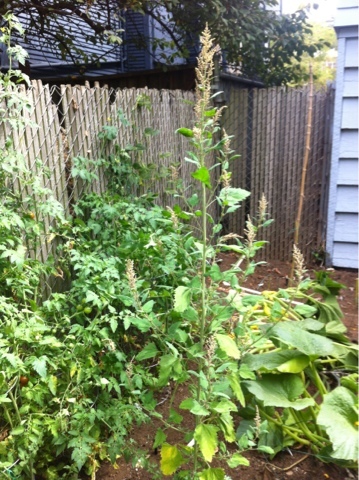 It showed up out of nowhere, amidst the parsley, and has shot up to be almost 6 feet tall now! I am convinced there is something about the Berkeley climate that is in the mix. I never have this much success with tomatoes! All I can say is that I am looking forward to a delicious dinner soon! Hmmm perhaps so! 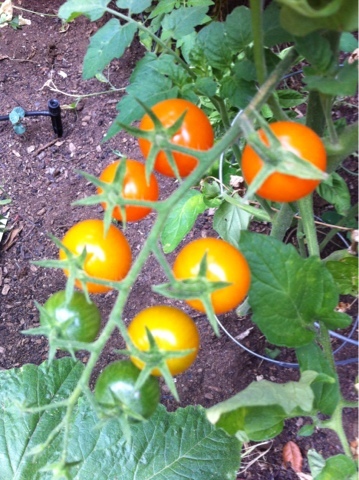 You would think that with that LA sunshine you'd get all kinds of tomato growth! Hey @kimskitchensink:disqus , have you considered shrinking your photo's to fit into the blog post? It covers a few widgets. The search box is in the upper left hand corner - not sure what Gawk.it is, but it's the generic search box provided by Blogger. You don't use gawk.it? It is that social search engine shown on AVC. Your site is listed as one of the users of Gawk.it. I have no idea. If I am using it, it's not because I intentionally signed up. Hi falicon - I'm not looking to add anything new to my blog just yet, since I'm in the process of re-designing. I'll keep gawk.it in mind though. Thanks for reading!